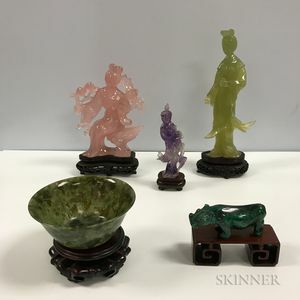 Five Stone Carvings, China, a standing Guanyin in jade green stone, a seated Guanyin in pink quartz, a standing Guanyin in amethyst, a small serpentine jade bowl, and a malachite hippopotamus, ht. to 7 1/8, wd. to 4 3/4 in., all with wood stands, in boxes. figures with chips to details, hippo with a repair to a foot, bowl in good condition.